The Skagway Borough Assembly formally voiced its support for Police Chief Ray Leggett at a meeting last week. Leggett lost his Alaska police officer certification earlier this year after a lengthy legal battle with the state. Now, Skagway officials are affirming their support for Leggett to stay on the job. But they’re also updating the police chief job description and personnel policy. 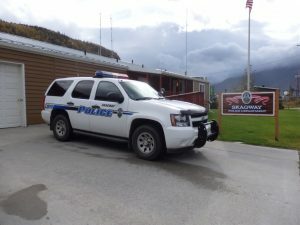 Leggett came under scrutiny of the Alaska Police Standards Council after he conducted a lie detector test on his disabled son, who was the suspect of an investigation in Haines. The council revoked Leggett’s certification on the grounds that he lacks good moral character. The decision went against an administrative law judge’s recommendation. The judge said the council did not prove that Leggett lacks good moral character, just that he displayed bad judgment in a difficult situation. Leggett has remained on the job during the police standards council’s investigation and following the loss of his certification. Alaska law exempts “chief administrative officers” of police departments from the certification requirement. Leggett met in private with the borough Assembly at two meetings. After the most recent meeting last week, Tim Cochran made a motion which was unanimously approved by the Assembly. In an email, Borough Manager Scott Hahn said the Assembly wants to update the job description to clarify that state certification is not required for the Skagway chief. The job description currently says the chief must be eligible for certification. Hahn said the review of the personnel policy is to clarify that police employees should avoid any involvement in a police matter if it has to do with the employee’s family member. That’s what got Leggett in trouble in the first place – offering to assist in the Haines Police’s investigation of his son. The manager’s recommended changes to the policy and job description will go to the assembly before being finalized.